What else do we want and need to know about doulas and doula practice beyond the association with selected birth outcomes? By studying doulas, what else becomes important to investigate in the broader area of women’s experience of birth, the professionals involved in birth and the institutional contexts of birth? Here are some questions and ideas for continued research that emerged in the course of my study. One doula recommended that we look at countries where maternity care is sub-optimal. In these countries where social arrangements of childbirth support are inadequate or non-existent, can we find any correlation or causal relationships between rates of infant abandonment; declining birth rates; or illegal, unsafe abortions? What other social and reproductive practices and behaviors might be linked to poor maternity care? 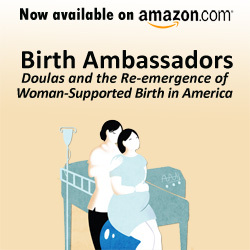 To answer the question of whether doulas support the status quo or contribute to changes in social practices around their clients’ birth choices, it would be valuable to examine, what, if any influence doulas have on women’s choice of care providers or hospitals in their current and future pregnancies. How do doula messages about childbirth influence women’s plans for future birth interventions? To answer the many questions emerging from these doula accounts about the current hospital management of childbirth support, and to tease out the relative impact of nurse and physician attitudes and practices, it would be helpful to have more systematic understanding of how doctors and nurses orient to labor pain in their clinical practice. Does labor pain have value in their view? How does dealing with labor pain affect their view of their patients? Of their ability to do their jobs? How does their medical training affect how they see pain and methods for its relief, including non-pharmacological methods, and labor support? How do they view doulas? What motivates nurses and physicians to work in obstetrics? Have those motivations changed over time? Is the orientation of birth as the ‘happy event’ still current in today’s litigious culture where we see more physicians dropping out of obstetrics and fewer entering it? What does it mean for women-centered birth as more females are being trained as ob/gyns? How has the sexual element of birth been incorporated and/or transformed in the medical setting? How are power relationships negotiated and how are women’s bodies and subjectivities employed in these negotiations? Many scholars have examined the motives of women choosing home birth. What motivates women who choose a doula for their births? What are their experiences with doulas? It would also be helpful to learn more about how their partners and other family members view the doula’s role and actual support at the birth. What reasons do women give for considering, but rejecting the idea of a doula at their births? How do they reflect on their experience and their decision after the birth? What factors make it possible for women to work as doulas? It would be interesting to hear from the perspectives of others in the social networks of doulas. How do their male partners view doula work? How do they rearrange their lives when the doula is on call and at a birth? How is the work justified? What are other family members’ reactions to doula practice? Examining these questions would allow us to see how doula ideology is conveyed to others in their social networks. We need more cross cultural research on doula care. How is the message of labor support conveyed to other cultural groups? How is it received? What aspects of the doula ideology are specific to the American context of medicalized childbirth? What are the cultural assumptions underlying doula notions of ‘emotional support’? How are issues of class, ethnic/racial identity, personal birth experience and age salient for doula practice? How has the Internet influenced, affected, transformed the ways specialized interest communities can collectively share information and organize as social movements? Doulas embraced the Internet from its earliest days, gathering in local and international chat rooms, and offered their vision of birth on a playing field that gives them a platform to respond to mainstream views of birth. How does a couples’ experience of birth affect their parenting practices and their marriage relationship (unasked in many studies of transition to parenthood). How do doulas accomplish their goals within medical interactions? We would benefit from observational studies of doula care, in addition to the accounts of doulas. How have the related professions of nursing and social work dealt with the demands of professionalization and credentialization? What can we learn from the history of childbirth educators and lactation consultants about the fragmentation of care and information surrounding women’s childbirth and postpartum experiences? As more hospital based doula programs are developed, it would be helpful to do a comparative study of doula practice in these settings with individual doula practice, especially with regard to information/advocacy roles. How do community based doula programs work? What are their outcomes? How is doula ideology transformed and shaped in cultural contexts beyond white middle class frameworks? How can we theorize doula care, doula practice and doula ideology? Where do they overlap and where are they divergent? What are your research questions about doulas?! Thanks for this Christine! Very valuable and thought-provoking!